As you may know (if you’ve been reading my tweets), I’m hoping to be eating the WHOLE of Sheffield (well, I’ll give it a good try). During the week 4th – 10th July 2011, Sheffield Food Festival Week, I’ve set my own ‘Missie Cindz’ food challenge where I’ll be eating and drinking a huge range of Sheffield related produce, ranging from making my own foods at home (breakfasts) using Sheffield grown/sourced ingredients, to eating and introducing to you lots of homemade Sheffield products – these hidden gems need forking out and sharing, and who else better to do this than your colourful ‘greedy’ little Missie! Being on a strictly controlled ‘Sheffield diet’ won’t be easy so I will need help and support from a few talented chefs (preferably from Sheffield, as I won’t be able to afford to pay for travel expenses :) I’m hoping as many people will get involved to spread the word, or why not join my Food Challenge and eat a piece of Sheffield with me? 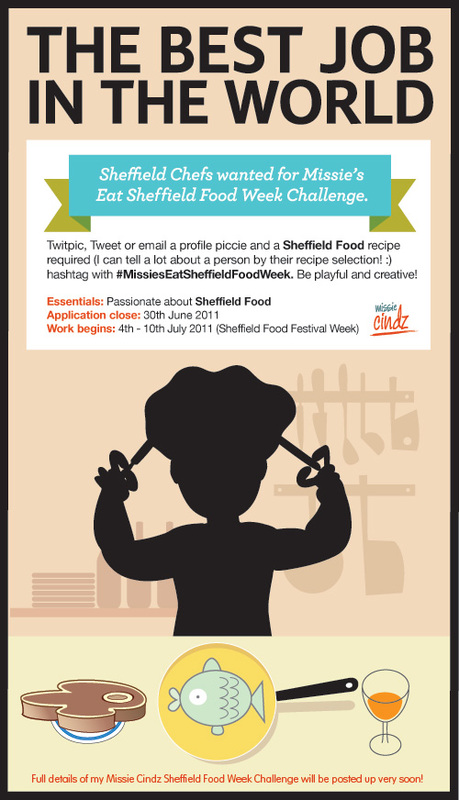 You can follow all my food challenge tweets under the hashtag #MissiesEatSheffieldFoodWeek. Currently lined up for Sheffield Chef interviews include: PJ Taste and the good ol’ Rutland Arms Chef. This vacant post won’t be easy as you must have more enthusiasm and passion for Sheffield Food than ME! More details of my Food Challenge will be posted up very soon and I’m looking forward to sharing with you my ‘Sheffield Food menu’ once it’s ready, it’s currently looking very wholesome.